By Greg Danvers – National Media Manager. The annual Wagga Gala Day, held at Henwood Park, was a well run and attended event with Wagga High (9-0) too strong for Mater Dei Catholic College in the Bill Turner Cup (Boys) while The Riverina Anglican College (7-0) outclassed Kooringal High in the Bill Turner Trophy (Girls) in the round 2 games. Kai Watts, after dominating the round 1 match against The Riverina Anglican College, a 7-0 rout, scored four in the round 2 encounter. Coach Philip Willis was pleased with the result and has called on his charges to again display a team effort in their next match – against the winner of the Wagga Christian/Kildare Catholic to be played in the second term. In the Bill Turner Trophy (Girls) The Riverina Anglican College progressed to round 3 with a 8-1 victory over Wagga High in round 1 and backed up that win with a 7-0 win over Kooringal High in their round 2 match. Defender Abby Wood was TRACS marshal, directing traffic ensuring cohesion of her team mates in transition and the press. Striker Ines Treharne netted a hat trick off the back of excellent team work. The Bill Turner Cup (boys) is in its 40th year and the Bill Turner Trophy (girls) is in its 28th year and is regarded as one of the largest sports team competitions in the world. This year 850 school teams from Queensland, NSW, ACT and Victoria participate each year, with all players 15 years and under in the knockout tournament. There are 450 boys and 400 girls teams entered for 2018. More on the 40 years of Bill Turner School Football at: Humble beginnings to four decades. The Riverina Anglican College 8 (Hannah Billett 2, Tess Buckley, Abby Wood, Ines Treharne, Tootsie Lamb, Tahlia White, Abby Clarke (go) goals) beat Wagga Wagga High School 1 (Marwa Sulaiman goal). 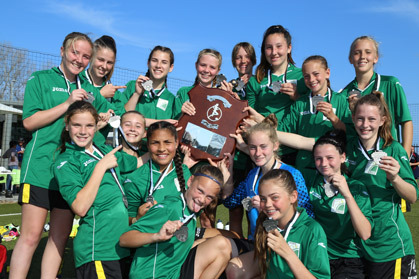 Kooringal High School 4 (Jessica Wild 2, Ebony Lewis, Malellen Monteleone goals) beat Mater Dei Catholic College 2 (Bethaney Macarthur, Mally Surian goals). The Riverina Anglican College 7 (Ines Treharne 3, Hannah Billett, Lara Jay, Tahlia White goals) beat Kooringal High School ). Wagga Wagga High School 6 (Kai Watts 3, Pat Cooke 3 goals) beat The Riverina Anglican College 0. Mater Dei Catholic College 1 (Jeremy Piercy goal) [8 pens] beat Kooringal High School 1 (Pacific Mumezero goal [7 pens] after regulation and golden goal additional time. Wagga Wagga High School 9 (Kai Watts 4, Zac Steeple 2, Declan Rohrich, Aryam Sameri, Tom Prescott goals) beat Mater Dei Catholic College 0. On Monday (9 April) Riverina Area Manager David Dunn was a happy observer as The Riverina Anglican College’s Ian Begg ran the annual Wagga Wagga Gala Day. David, who taught Science for the duration of his career at Kooringal High School, has a rich history in Bill Turner Cup being appointed Riverina Area Manager in 1980. His school – Kooringal High – placed third in 1996 at the National Finals in the City of Lake Macquarie, NSW.